Apprentices start from 40 to 60 percent of the journey level wage. 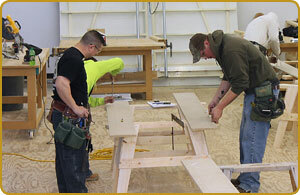 During the four-year program, apprentices receive wage increases every six months. Apprentices also receive benefits during the program. Upon completion of 640 hours of class time and 5,200 hours of on-the-job experience, the hourly wage and benefits package increases to the journeyman level. Wages and benefits vary by county for carpenters and millwright/pile drivers.